The 2nd Leg of the Neil Young + Promise of the Real 2015 Rebel Content Tour has come to a conclusion. With an intense 23 concerts (12 concerts in 1st Leg, 11 concerts in 2nd leg), a quick check of the setlists via the ever so indispensable Sugar Mountain reveals a number of interesting statistics. A total of 63 different songs were performed. Lincoln, Nebraska (2015-07-11) was the longest concert with 29 songs played. 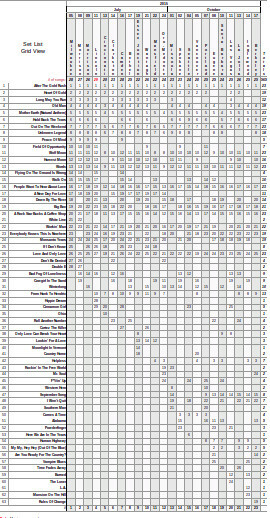 Cincinnati, Ohio (2015-07-13) was the shortest concert with 20 songs played. That's just a quick analysis of the 2015 Rebel Content Tour setlists. Certainly more interesting statistics can be found on Sugar Mountain . Thanks Tom for making it all happen for Neil fans every single concert and every single tour! Long may you run, our friend. 45 songs played on east coast leg 1. 18 songs added on west coast leg 2.Two songs Lukas Nelson sang.Moonlight In Vermont performed in Essex Junction,Vermont and September Song played 8 times on west coast shows. Prediction for 2016 tour.Set 1. Neil with Promise Of The Real. Set 2. Neil Young Crazy Horse.Now that would be the Monsters Of Garage Rock Tour. Wishful Thinking!!! What Do You All Think? Nice to see you looking forward to 2016! Maybe dreams really do come true?! I went to two of the shows in California, Santa Barbara and San Diego. I began to regret not getting tickets to the show at the Forum soon after the encore in Santa Barbara! Ironically, F*#!in' Up...The solo acoustic opening appeased the folks who came to hear the mellow stuff, the two hours that followed convinced me that Neil still has that "fire" inside, and Promise of the Real seems to have inspired him, as he no doubt inspired them. The San Diego show really was probably the best concert experience of my life. The all general admission seating, or standing if you chose the floor, provided the true fans of Neil Young the chance to get right down in front of the stage. Usually, the orchestra seats are occupied by the people who can afford them, not die hard Rusties! Taking my 19 year old daughter to that show made it extra special for me. She told a friend she made, who was there with his mom, that this was her second Neil Young show, and she has been listening to him her whole life...literally. She went to the solo acoustic show at The Dolby Theater in LA last year. She had been hearing Neil on my car stereo since she was a baby. Now that this leg of the tour is over, with only the Bridge School Benefit on the calendar, I wonder if there will be anymore shows, a live album or concert film? I really don't want the collaboration with Promise of the Real to be over. I do realize though that Neil will go wherever his muse leads him, and I will follow. Thanks You Thrashers Wheat for keeping us informed and enlightened. Epic, epic time to be a NY & POTR fan! Who could have ever imagined the tour we just witnessed? Thanks Thrasher for documenting the whole gig and for hosting a correspondingly epic site where folks can congregate. Its truly a daily highlight to visit TW!! I'm going to try to reach out separately to send an unsolicited but well deserved contribution. I've said before and I'll say it again: Play Europe!